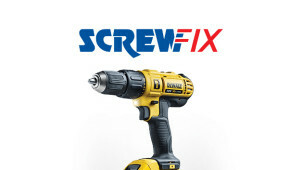 Screwfix is the largest retailer of trade tools, accessories and hardware in the UK. They’re part of a global organisation called Kingfisher plc, which owns over 1,100 stores operating in 10 European countries, Turkey and Russia. Screwfix has a massive range of products available for tradespeople, who can shop over 28,000 items online, over the phone, on their mobiles or in-store. Those who don't have time to make orders during the day will be please to hear that Screwfix take orders up until 7pm (weekdays) for next day delivery, so you don't have to worry about your projects being held up. Those of you who want to order products such as a door, flooring or a drill from the comfort of your own home or site office will be glad to hear that Screwfix now offer Click & Collect. Simply choose a Screwfix store you want to collect from, complete the online payment procedure and then your order will be ready for collection as swiftly as one minute after confirmation! How do I use my Screwfix discount code? Sign up for a Screwfix Card, which makes life easier by keeping all your orders stored under one account. Once on the mailing list, you’ll be alerted to regular promotions, deals and the odd voucher/free gift. Do Screwfix have an app? Yes, you can download it on Android or iPhone handsets. On this platform, you can download the catalogue, order online, add items to lists as well as organise Click & Collect or delivery. Do Screwfix offer a trade credit card? Yes, the new Screwfix Trade Credit Account, provided by Trade UK is a great way to manage your business accounts. You get up to 60 days free credit and they offer flexible credit limits. How can I find my closest Screwfix store? Simply add your postcode or location to the search box on their Store Finder page and hit go to find one of 521 Screwfix stores. How can I rate and review Screwfix products? Simply sign into your Screwfix account, find your product through ‘Order History’ or the search box. Write and submit your review, and you’ll be automatically entered into a weekly prize drawer! Free returns with Screwfix 30 Day Money Back Guarantee. Take your unwanted or faulty items to a Screwfix store and bring your receipt, invoice or order reference number to speed things up. An exchange or refund can be given against the original payment method. From cables to power tools, garden buildings to maintenance and care to spruce up your outdoor space this summer - Screwfix has it all under one roof. With 11,000 products available from over 500 stores nationwide, you can use a Screwfix discount code to help lighten the load on your wallet when a DIY project is on the horizon. If your living room needs a summer revamp or you fancy installing some new lighting in the office, Screwfix will help you get kitted out. You’ll be please to hear that Screwfix take their environmental credentials seriously. All their timber and wood products are FSC or PEFC certified and come from sustainable sources. So, next time you’re rooting around their catalogue on your tea break, you’ll know that even the catalogue pages are sustainable! They’re also keen on saving energy for customers - so look out for the green ‘save energy’ label on electricity and gas related products. Whether you're on the lookout for indoor spotlights or an outdoor lantern, Screwfix has a huge lighting section that's ready to jazz up your home for the summer months. Style your surroundings using a Screwfix promo code to invest for less. Whether you go for smart LED downlights, something for the kitchen or bathroom - now is the time to refresh your home with a new lighting look!